We have been to Maui many, many times, but schedules have never lined up for us to attend George Kahumoku Jr’s Masters of Hawaiian Music Slack Key Show on the beautiful island of Maui. 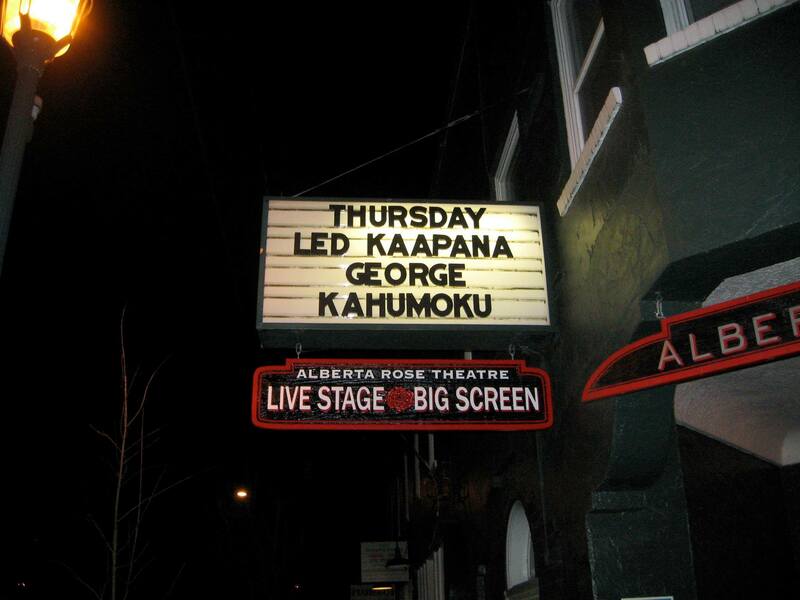 So when George Kahumoku Jr. and Led Kaapana announced they were coming to Portland, it was an opportunity not to be missed! Slack key is a distinctive guitar style that originated in Hawaii and it just seems to “fit” with the Hawaiian islands…open, airy, playful, soothing, exciting, and mesmerizing, all at once. As a novice slack key guitarist myself, I’ve been privileged to play (or shall I say dabble with) this style of music while watching the ocean and feeling the breezes in Maui. It is interesting to see how geography can actually influence a musical style, but when listening to slack key you can actually feel the rhythm of the ocean waves and hear the sway of palms. In fact, during one of George’s songs, he even had the audience join him by inserting a “swishhhhh……chrrrrrrrrr” into the melody. We were a long way from Hawaii, but we still heard the warm ocean! George is a great player and entertainer. As I’ve found with most people from Hawaii, they enjoy “talking story”, and bringing in tidbits from their life as they play their music. One of the highlights of the evening was having George’s wife Nancy come up on stage and dance hula to several songs. I just love seeing husband and wife partnering like this! Led Kaapana was equally entertaining, and as a fellow guitarist, I was truly impressed with his fingerwork. He shared how he grew up playing music on borrowed instruments, and never even learned the “proper” names of chords or notes until he moved off of the Big Island and started playing with others. Watching George and Led play together took the experience to a whole new level as they interacted and tuned in to each other over the course of numerous songs. Experiencing Slack Key guitar in (relatively) frigid Portland was a great mid-winter experience. Next time you are on Maui or another Hawaiian island, or if you are lucky enough to have masters such as George and Led come through your town, don’t miss the opportunity to experience ocean waves and breezes through the art form of slack key guitar. This entry was posted in Uncategorized and tagged Hawaii, Maui, music, slack key guitar by davekresta. Bookmark the permalink.